What to Expect in Japan Part 1: Uhm…Well, Duh! 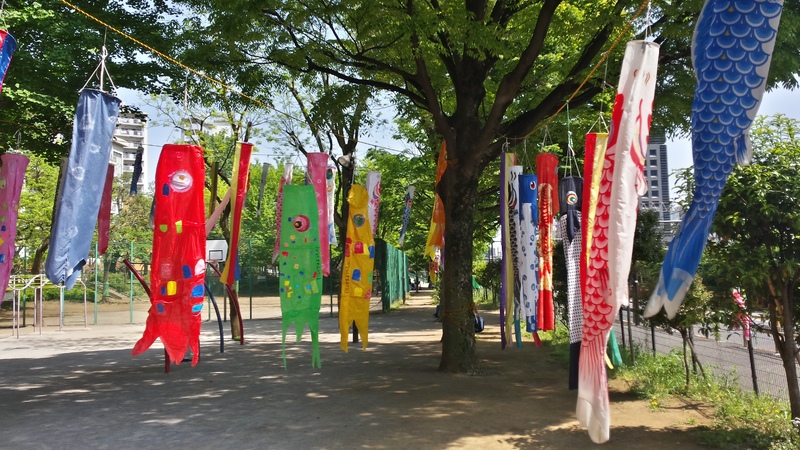 The Koinobori hanging up in a children’s park in northern Shinjuku. Now originally, I wanted to write a single post with all the things one should expect to find in Japan ranging from the obvious to the not so obvious, but as I started writing, I realized I had a lot to say and a lot more to experience on my trip, so why not a write series over the next few months while specific topics were still fresh on my mind? I have just returned from a three day trip where I and two other American students tried to cram as much of Tokyo into those three days as possible. I have felt my feet crying out for mercy since the first day, but I could not put them out of their misery until I had quenched my thirst for adventure. I have been studying Japanese language and culture in formal classes since my first year of college (about 3 years ago), but no textbook, J-Drama, or anime could have prepared me for an actual trip to Tokyo. (Part of me expected to find at least one ward in ruins from some sort of monster attack, but that was not the case) But as I said, my expectations of Tokyo were almost nothing like the ones I had formed from behind my desk (or preferably in my bed with my comfy purple back pillow) as I read and watched about culture, pop-culture, language, and etiquette. As I said, I returned yesterday, exhausted after a 10 hour night bus ride with no sleep (because I’ve never been able to sleep in moving vehicles). I felt the same sleep-deprived relief when I finally arrived in Tokyo via night bus a few days prior. The bus driver dumped us near Shinjuku Station and sped off with the rest of the early morning traffic. Naturally, one’s first thoughts of such an amazing place should be something along the lines of, “I can’t believe I’m in Tokyo!” I took one look around and thought, “What now?” And then a few moments later I added, “God have mercy on my soul.” (It isn’t abnormal for me to have melodramatic thoughts; they just usually translate into my shoving my face full of food instead of verbal eloquence.) We had an address for our hotel, our luggage weighing us down, and no idea of how to get where we needed to be. We wandered Shinjuku Station for several hours, and then we wandered northern Shinjuku for a while before we found our hotel. During that time I did indeed shove a McGriddle, hash brown, and cinnamon roll into my mouth. I’ve spent many summers in San Antonio, Texas with my grandmother. I’ve been to Houston and Dallas. When I lived in Arkansas, I made frequent trips to Little Rock on my own. I’ve been lost in Memphis and St. Louis as well. How different could those places be from Tokyo? Seventeen years. That’s how different it is. I’ve been speaking English for 17 more years than I’ve been speaking Japanese. With my luck, I knew things would go wrong. And so lost that I didn’t think it was even possible to get even more lost. Finally, I tempted fate and stopped trying to think of whether or not it could get worse. And it still did. On our final night in Tokyo, my friends and I planned to find a few stores (and try out the world’s first Japanese Taco Bell) in Shibuya. But guess what? We found ourselves in the middle of a Cinco de Mayo festival instead. Instinctively, I bought a watermelon smoothie and churro to hide my panic. After failing to understand the map, we decided to ask for directions. Again. We scanned the crowd at the crosswalk, looking for someone who seemed to know what they were doing. Finally, we spotted a young couple behind us. I sidled over to them and told them we were lost. The young man, Gak, stared us three American girls for a moment before pulling out his phone. I bit my lip as he hmmm-ed over the Google map on his screen. His companion, Mai, giggled and instantly began speaking to me about school, jobs, and the holidays. Amused by my Japanese, a smile never left her face even when I couldn’t convey exactly what I wanted to say. She thought it was particularly adorable that I wanted to buy a yukata for an upcoming festival. Gak even smiled a bit. We walked for about fifteen minutes, and it ended with my group safely in front of the Oriental Bazaar. Gak sidled back over to Mai, and we thanked our newest guardian angel. “Have a nice day,” he told us in a quiet voice. And then I asked him how to say it in Japanese. “よい一日を！” (“Yoi-ichinichi wo!”) I called after them. The duo erupted into laughter and smiles once more. The day before, I met an American couple in the elevator of Tokyo Tower. We chatted for a moment after realizing we spoke the same language. The young man rolled his eyes a bit and chuckled. “Everything’s in Japanese here. You wouldn’t believe how hard it is to order food.” My friend and I looked at each other for a moment trying our hardest not to grin too much, and we told them the words for fried chicken and fish. Our elevator ride ended, and the couple left. Later that same day, my group settled down in an Alice in Wonderland themed café. We probably frazzled our poor waitress (who told us to call her Alice) with our questions, but we communicated enough to get our food and drinks. Another English-speaking group settled down next to us, and after several loud remarks about wasting money “paying for ambiance” (which is kind of the purpose of a themed café by the way), they fired English question after English question at Alice. When their English didn’t get through to her, they spoke even louder and louder. Alice stared at the group wide-eyed and eventually nodded in response to all of their questions before running off. After a while, another Alice returned in her place to explain about the custom cocktail menu in English. I did as many “touristy” things as I could during my vacation. I toured a Sanrio store, explored temples, climbed Tokyo Tower, and snacked on freshly made crepes, but I didn’t come to Japan to “pay for ambiance.” I could write all day about the attractions and food and fashion, but experiencing culture is more than tasty fish and ancient temples. As I sat in Akita Station completely exhausted from 24+ hours without sleep and one grueling night bus ride, I thought about my communication skills. Suddenly, an elder woman approached me and my friend. She told us something, and when we responded in Japanese, her face lit up. The conversation reminded me of some of my family dinners, topics weaving in and out of relevance. Houses, Zambia, my friend’s leg and its likeness to her owl wallet, something about this woman’s father and schooling. We pulled out dictionaries and laughed and winced. We tried. The woman laughed with us and lowered her head in a slight bow as she prepared to leave. ““よい一日を！” I called after her. If you really, truly want to enjoy Japan, don’t just expect beauty, but expect kindness and patience and good conversations. Expect frustration and smiles and knowledge.